All Baltimore Curriculum Project schools have strong school cultures that support academic success. The schools utilize a variety of strategies to build school culture including CHAMPS, Restorative Practices, and leadership programs. CHAMPS is a research-based approach to behavior management that helps classroom teachers design (or fine tune) a proactive and positive classroom management plan that will overtly teach students how to behave responsibly. 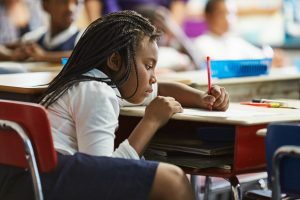 By following the effective, research-based practices outlined in CHAMPs, teachers develop methods for clearly communicating their expectations on every classroom activity and transition. BCP began using CHAMPS in 1996. For more information visit Safe and Civil Schools. Restorative Practices is an integral part of the school culture at all BCP Schools and provides a constructive alternative to suspensions. Restorative practices provides a proactive approach for building a school community based on cooperation, mutual understanding, and respect. Restorative practices provides processes for holding students accountable for their actions and behavior while at the same time building a nurturing school environment. BCP implemented Restorative Practices in 2007 with the support of grants from OSI-Baltimore and the Goldsmith Family Foundation. For more information visit the International Institute for Restorative Practices.